MARP is inviting students, in particular, and the public, in general, to join us in a discussion of public transportation issues in SE Michigan. Leading our discussion will be two of Detroit’s leading advocates for transportation choice and equity. Megan Owens is the Executive Director of Transportation Riders United, otherwise known as TRU, which has been at the forefront of efforts to make true regional transportation a reality. Joel Batterman is Coordinator for Motor City Freedom Riders, an organization founded on the belief that transportation is freedom and that freedom of mobility for all can be won through the power of grassroots community organizing. The discussion is timely, given the recent announcement of a revised regional transportation plan that may be put before the voters in November. Prominent features of the proposal are commuter rail service between Detroit and Ann Arbor, the addition of fifteen high-frequency regional routes, fifteen express routes for commuter and airport service, and infrastructure improvements along five premium routes to increase reliability. Read the full proposal here and view the map. We encourage all our members in the Metro Detroit area to make a special effort to be with us for this important discussion. And we challenge each of you to bring a friend with you. Following the meeting, we will hop on the QLINE streetcar to see what’s happening along Woodward Ave.
Free parking is available in the secure MSU lot on the corner of Cass and Stimson, one block west of the MSU Detroit Center. Free and metered street parking is also available on side streets surrounding the facility. MARP’s October 21 meeting will be in the Conference Room on the 2nd floor of the Grand Rapids Transportation Center, beginning at 10 a.m. Just to the south of the Transportation Center building and bus canopy is the new Vernon J. Ehlers Amtrak Station. This meeting will be an opportunity to brainstorm ideas for MARP activities over the next twelve months. Among topics for possible discussion are: recruitment of new members, creative ideas for doing outreach, next steps for the Coast-to-Coast proposal to restore passenger train service connecting Detroit-Ann Arbor-Lansing-Grand Rapids-Holland, and addressing station staffing issues. Your ideas are important to moving forward in the coming year. You might want to plan to catch The Silver Line, Michigan’s first bus rapid transit line, at the 54th St and Division station. Exit US-131 at 54th St. and go east a few blocks to Division. It appears there is parking on the NE corner of this intersection. The bus will take you to Rapid Central Station. Following the meeting, we will enjoy lunch (no host) across the street at Founders Brewing, one of several venues that are part of the transformation of downtown Grand Rapids into a thriving destination spot. MARP will hold a general membership meeting on Saturday, September 23 at Durand Union Station, 200 Railroad Street, Durand MI 48429. NOTE the change in start time: the meeting will begin with socializing at 9:30 AM and run until Noon. You won’t want to miss the speakers we have lined up. William Hamilton, senior analyst, Michigan House Fiscal Agency, will tell us about the history of funding for state supported trains and the very interesting “sausage-making” procedures of the May Budget Conference tasked with meshing House and Senate bills to finalize the annual state budget. From MDOT’s Office of Rail, Michael Frezell, Communications, and Al Johnson, Passenger & Operations Manager, will have updates on ongoing projects of the MDOT Office of Rail. The 44th Annual Meeting, originally set for this date, has been tentatively rescheduled for November. West Michigan is beautiful this summer! The blueberries are ripe, the sweet corn is ready and the Freestone Pickles may be curing in the barrels across the tracks from the Bangor train station. We hope you are planning to “come on out” to enjoy the sights and smells – and while you’re at it, join fellow MARP members and friends in the interesting meeting planned for us. Ron Pesch, author of “Big Wheels Turning: Greyhound in Michigan”, will treat us to the surprisingly interesting story of the 1914 Hupmobile that became a fleet of inter-city buses and the forgotten role played by West Michigan. The Odd Fellows Hall is located in the historic Funk, Steinman & Ely Building, above the Bangor Historical Society Museum. Look for the building with the big green awning on the south side of Monroe Street (aka M-43) a few buildings west of the railroad tracks. The Museum houses, among other things, a collection of Kalamazoo Toy Trains, which were manufactured in the Bangor train station during the years prior to restoration of passenger service in 1984. The museum is open 10AM to 4PM on Saturdays. For the gardeners among you, a visit to the Liberty Hyde Bailey Museum might be in order before you leave Bangor. The museum is located in the childhood home of Liberty Hyde Bailey, considered the “father of horticulture”. Saturday hours are 9AM to 4PM. Or you might plan a whole weekend of activities including fun on the beaches at South Haven or Van Buren State Park and a visit to the Michigan Maritime Museum. In its fifth year, the Conference focus has been expanded to encompass the broader Midwest region. In addition, the 2017 conference will join forces with two other events by leading rail transportation organizations: the Summerail 2017 event organized annually by the Freight Rail Transportation Committee (AR040) of the Transportation Research Board; and the annual meeting of National University Rail Center (NURail), the first USDOT OST-R University Transportation Center dedicated to the advancement of North American rail transportation. Events will kick off with the Student Scholarship Fundraiser Golf Outing at the Ridgeview Golf Course and Committee Meetings on Tuesday morning/afternoon, followed by the Opening Reception and live music with the Norfolk Southern Lawmen Band at the Bell’s Brewery “Backroom” in Kalamazoo. Technical Sessions will take place all day Wednesday, August 16, at the WMU Fetzer Center. The luncheon Keynote Speaker will be Joseph McHugh, senior vice president and chief for Amtrak Government Affairs and Corporate Communication. The opening plenary session is a panel on “Autonomous Vehicles and Their Impact on the Rail Industry”. Following that, three panelists will talk about “State DOT Rail Programs” in Ohio, Indiana and Wisconsin. “High(er) Speed Rail” will be discussed from the perspectives of IL-DOT, an academic researcher, and a rail and transit consultant from Parsons Brinckerhoff. Other break-out sessions will discuss “Future of Freight”, “Urban Rail”, “Short Lines”, and “Inter-City Passenger Services”. 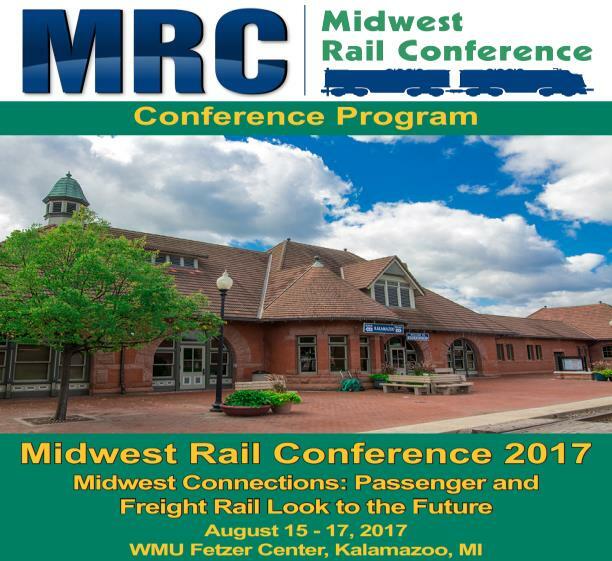 The conference will wrap up on Thursday with field trips featuring a visit to a Cargill facility in Decatur, a train ride to Battle Creek on the upgraded Wolverine Higher Speed Rail Corridor, topped off with a visit to the Little River Railroad in Coldwater. REGULAR REGISTRATION begins July 1 at a rate of $250 per person. Blocks of rooms at four Kalamazoo hotels will be held until July 24 for conference participants.